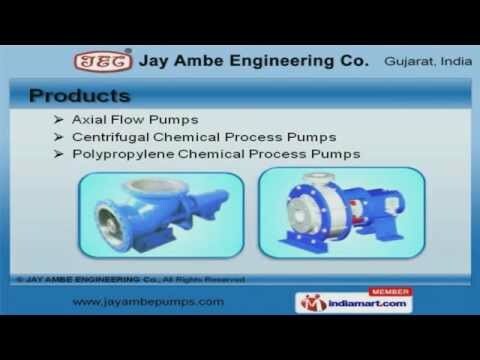 Welcome to Jay Ambe Engineering Company, Manufacturer and Exporter of Centrifugal Process Pumps and Pinch Valves. An ISO 9001 2008 certified company, established in 1996 at Ahmedabad. We have spread our wings to East Asia, Central America and other countries. Quality testing facilities, tailor made solutions and shortest delivery time frame are the factors that help us to stay ahead of our competitors. We offer a huge gamut of Axial Flow, Centrifugal and Polypropylene Chemical Process Pumps. Our Slurry Pumps, Side Channel Pump Wings and Pinch Valves are a class apart. We are engaged in offering supreme quality Pneumatic Pinch Valves, Rubber Sleeves and Seal Housings. Our Industrial Pumps, Centrifugal Pump Accessories and Polypropylene Chemical Process Pumps for Chemical Industry are well known for their durability. We have gained tremendous expertise in providing Centrifugal Chemical Process Pumps for Petrochemical and Textiles Industry. Our Axial Flow Pumps for Agriculture and Slurry Pumps for Metal Industry are extremely reliable.